Beautiful handmade girls Harry Potter Unicorn Hermione Spell Bow. Girls Popular Character Hair Bow Bobbles. Elastic Colours May Vary. 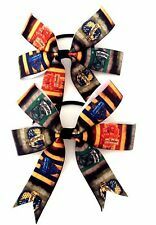 Handmade Slytherin and Gryffindor Harry Potter Bows. This listing is for 2 bows (one of each) Made on crocodile clip but can be made on hair bobble on request. You will receive 2 felties and they will arrive to you UNCUT. you just need a sharp pair of scissors to cut around him. these are handmade and you can order as many as you like. 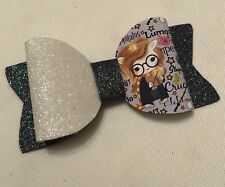 Harry Potter Hufflepuff 4.5" hair bow. Handmade harry potter Hufflepuff hair bow. 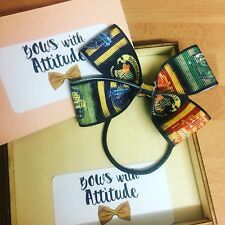 i also have other harry potter house bows available. Handmade harry potter Hogwarts hair bow. GROSGRAIN RIBBON MADE INTO A PAIR OF DOUBLE BOBBLES. . With Diamante Middle. Handmade Harry Potter Red and Gold Hair Bow. Harry Potter Inspired Hair Bow. School tie centre - really cute! Handmade on Alligator clip. Hand crafted super stacked colourful Inspired Bow. Character/film inspired Large Hair bow! As seen in pic. On a Hair Band. Fantastic beasts and where to find them hand crafted Hair Bows. (Pair) Condition is New with tags. All the bows bought or ordered are backed onto card and sealed in a cellophane bag. This is to ensure they reach you in the best and cleanest condition possible. The bows are completely handcrafted using a variety of ribbons and embellishments backed with a hair grade crocodile clip. Non toxic materials are used to create each bow so you can be sure they are safe. Dispatched with Royal Mail 2nd Class Large Letter. 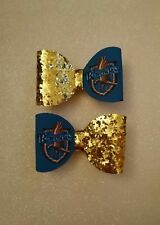 Handmade Albus Dumbledore black and gold 3 inch bow and Harry Potter red and gold bow. This listing is for 2 bows (one of each) Made on crocodile clip but can be made on hair bobble on request. beautiful handmade harry potter inspired bow house Gryffindor. this bow is 5 inches long. please check out my other items. Im happy to combine postage where possible . Dispatched with Royal Mail 2nd Class signed for posting days are Tuesdays and Thursdays if you need something quickly please contact me first it maybe possible if I know about it before hand.